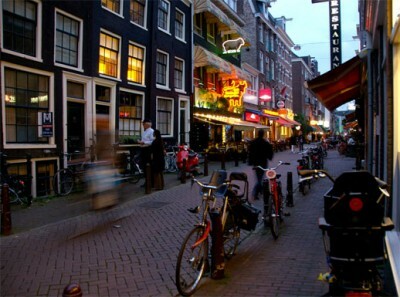 No other city in the world matches Amsterdam’s biking culture, where more people commute by bike than car. As one resident put it, â€œIt’s the quickest way to move around in the city, even more than a car or public transit,â€ and from a public official’s point of view, â€œEverything you do for a bike is very cheap compared to what you do for cars,â€ claiming that bike infrastructure improvements typically cost only 5% as much as automotive and mass transit improvements. – More than 75% of residents of the 750,000-person city own bikes, 50% use them daily, and 38% use them to commute, more than motorists. – In the center city, 60% of all trips are made on bikes. – The city hosts 240 miles of protected, dedicated, shielded bike lanes. By comparison, New York City has 5 miles of such lanes. – To incentivize biking, the city instituted an 18 mile/hour speed limit in the central neighborhoods and charges up to $7.50 for a metered car parking spot. – When a car and a cyclist collide in Amsterdam, the driver is almost always found to be liable. – Cyclists get a head start at traffic intersections by waiting in front of cars in a painted box. – The city implemented 70 special cycling stoplights that tell bikers how long until the light turns green. – The city installed 250,000 free bike racks, mandates that office buildings include indoor racks for employees, and built a three-story 4000-bike garage. Read more in the Brooklyn Paper’s Brooklyn cyclists would love Amsterdam – a truly bike-friendly city, then see how your city stacks up! Paris remains a leader in public bicycle systems with its 20,000 Velib bike sharing program. Photo of Amsterdam by mv4.